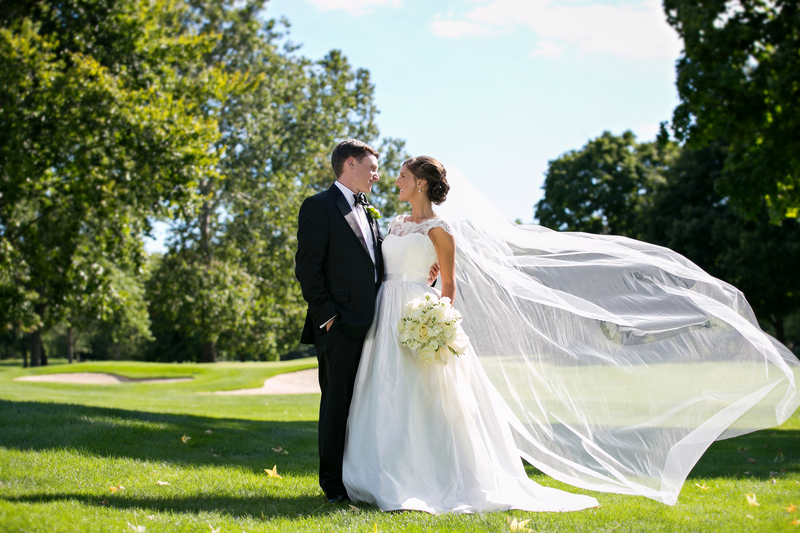 Alyssa and Brad’s wedding was during the peak of summer’s heat wave, and this stunning couple brought the hot hot hot! 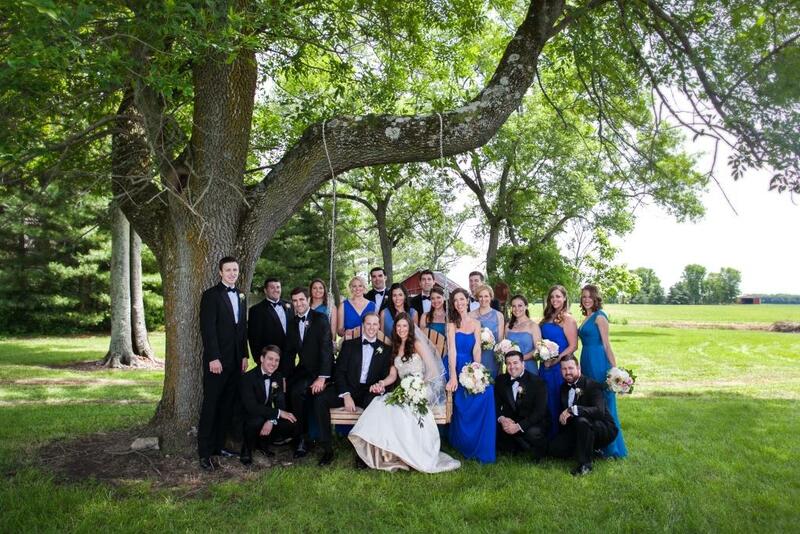 Alyssa wanted her guests to enjoy a luxurious evening as she and Brad said their vows to one another. She wanted a lush gala feel to the celebration. 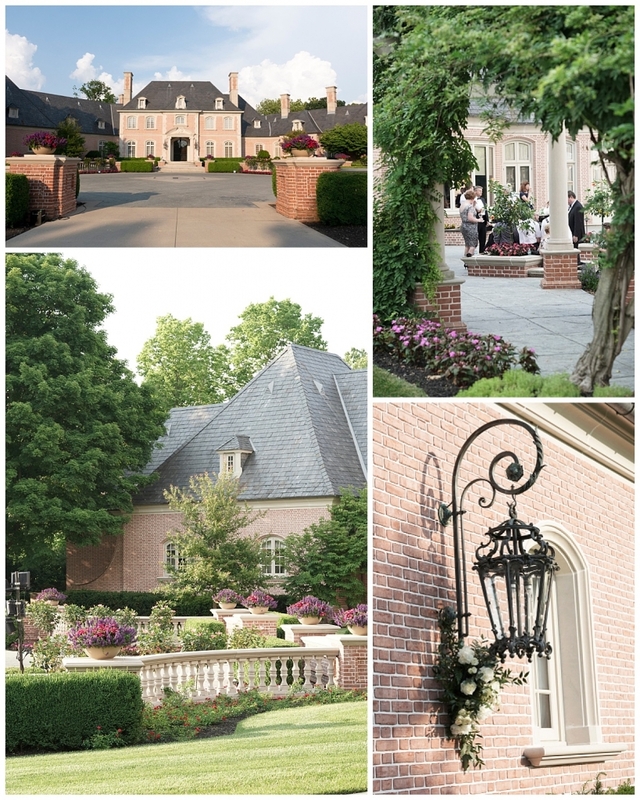 The tone was set immediately in the selection of venue, the lush Lucas Estate. 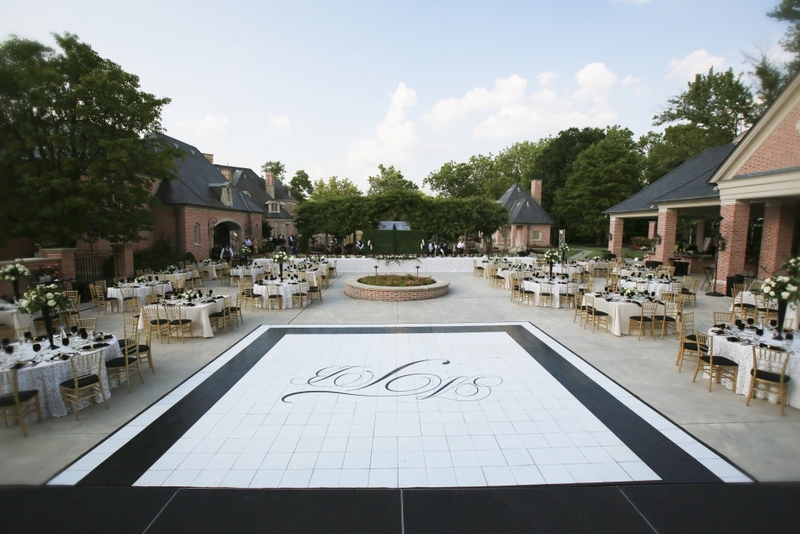 Guests meandered through the backyard and pool area to the ceremony space in the lower gardens. The ethereal scene awaiting them was intimate and sweet, and somehow seemed a world away from the bustling activity of the suburban lifestyle not a few hundred yards outside the estate grounds. 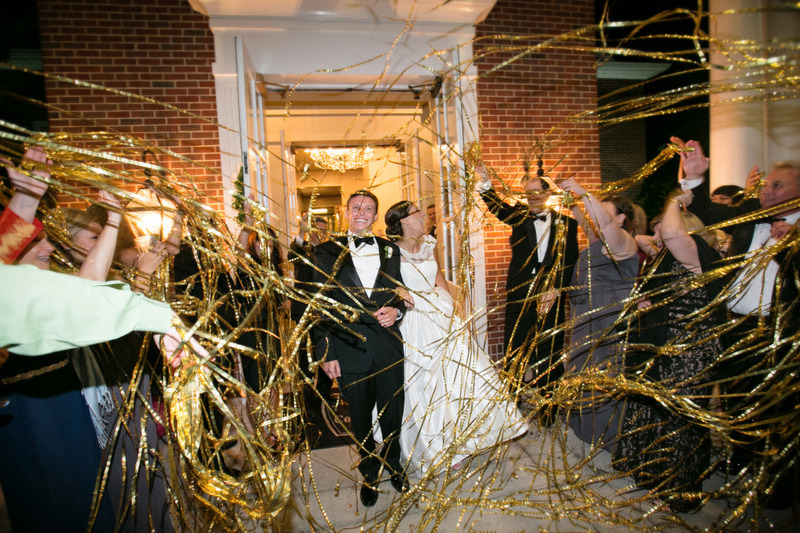 The wedding ceremony had so many touches of Jewish tradition that could not be overlooked, but I loved that Brad and Alyssa included a modern twist on the classic stomping of the glass. 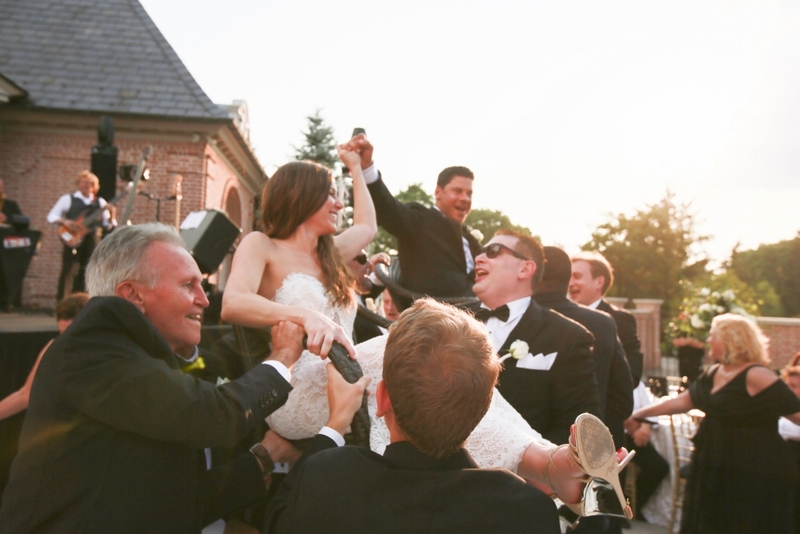 They included all of the guests in this moment – by having every guest stomp to break the shards to celebrate in their joy! 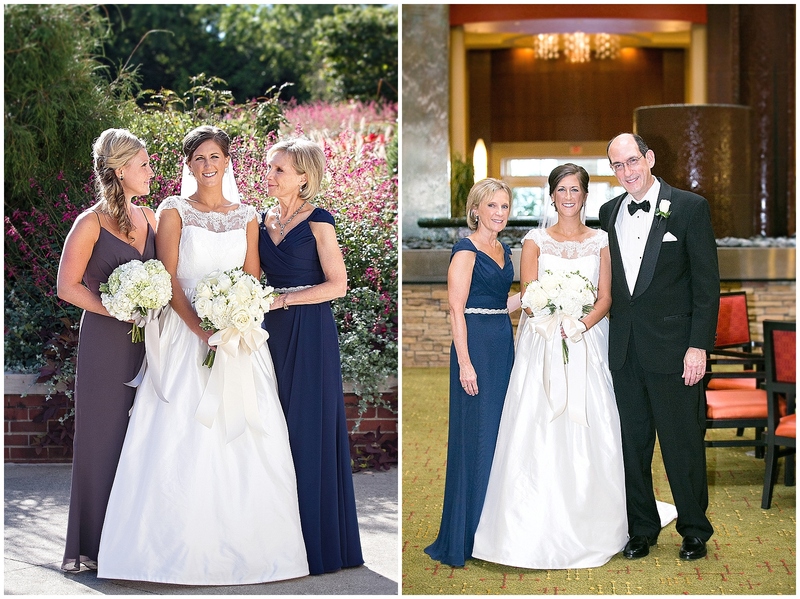 Alyssa, her mom and their golden bridal party were absolutely Haute! (I would have said that even if it wasn’t pushing 100 outside) They all looked so beautiful and I loved how truly kind and loving they were to one another. They were sisters, and besties, and confidants and shared in this amazing weekend with so much gladness and joy and I was truly honored to witness all of it with these lovely ladies. Each of them are stunning on the outside, and truly gorgeous on the inside. Following the ceremony guests enjoyed cocktails by the pool – and admittedly, were likely a bit envious of the surprise entertainment – the synchronized swimmers. While guests enjoyed cocktails, they also marveled at the estate, the grounds and the dinner set up Alyssa and Brad had created for the evening. 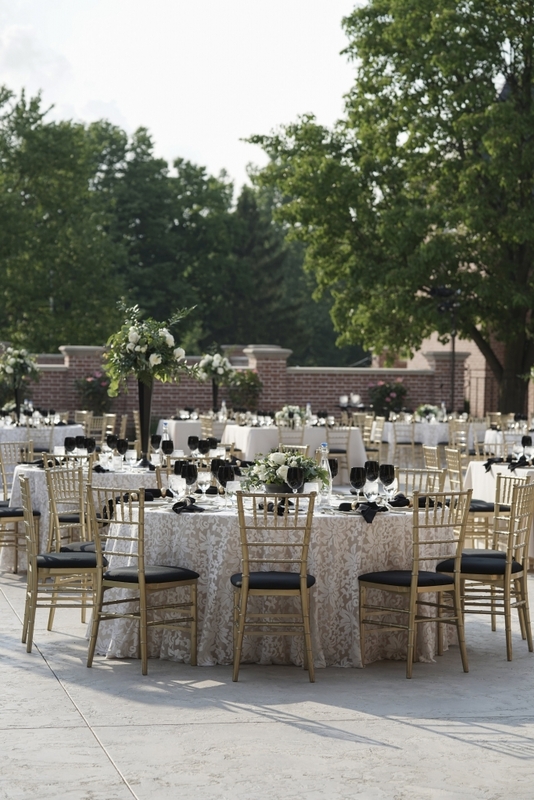 White, black and gold were the colors of the evening and in the summer sunlight, the beaded linens sparkled beautifully. Once guests were seated, they could see the beautiful details the couple had selected for their guests and enjoy the (oh my gosh, I am still dreaming about the short ribs) dinner Chef created! Abby and Matt, along with their families, are such warm and gracious people! They wanted their day to be filled with beautiful flowers, family tradition and great food — they had it all! 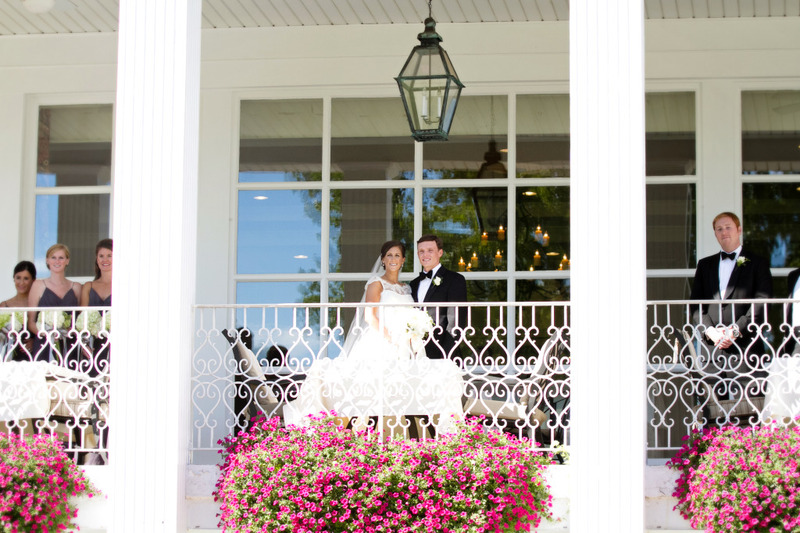 When Matt proposed Abby’s parents immediately took them to Meridian Hills Country Club for a glass of celebratory champagne. The Club has long held a place of family tradition and celebration, so hosting the wedding reception there seemed natural. It was the perfect location for their early fall wedding. 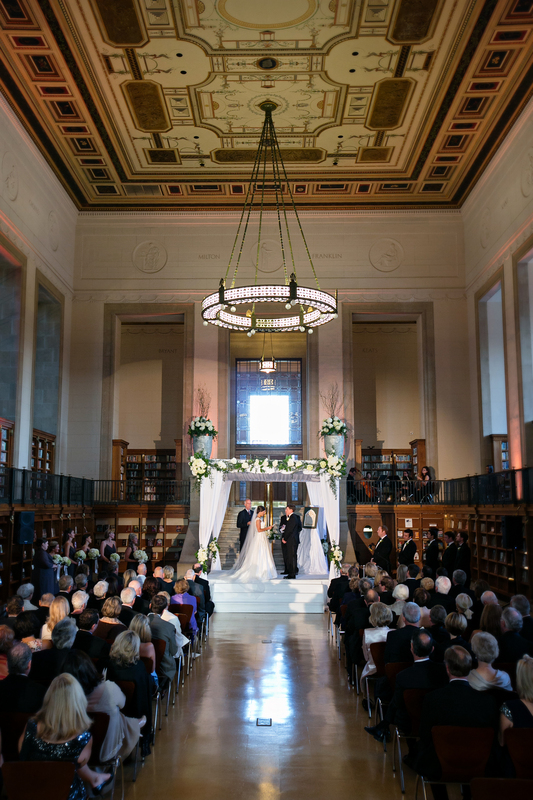 Their ceremony location was hosted in the stunning architectural jewel, the Simon Reading Room of the Central Library. This magnificent marble space with sweeping ceiling was the perfect location to host their unique ceremony. 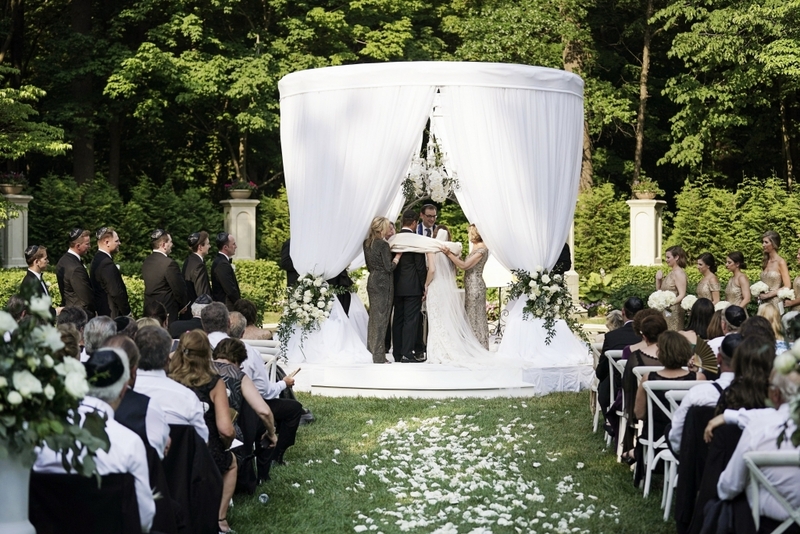 Abby and Matt needed to intertwine a Jewish and Christian ceremony and this space was the ideal setting for their service. While Abby wanted to have a stately Chuppah for her ceremony, she didn’t want to stand on the traditional right side, while she did want to have a Ketuba signing before the ceremony, she also wanted to have both a Minister and a Rabbi preside over the ceremony. 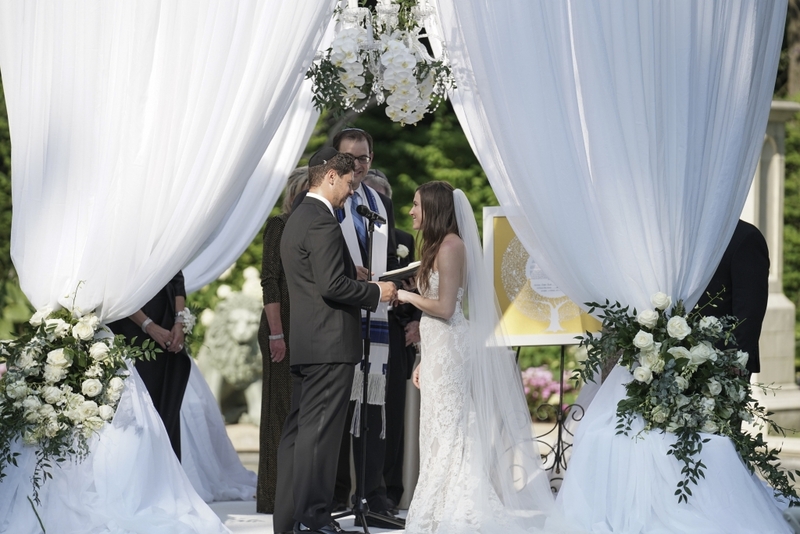 Selecting these officiants was an enjoyable process, because both the Rabbi and Reverend were both very excited to weave the religions together to create a beautiful and blended service for the two families joining as one. Once guests were inside the ballroom, Abby and her mother, Lorna, wanted them to have a sense of traditional luxury. 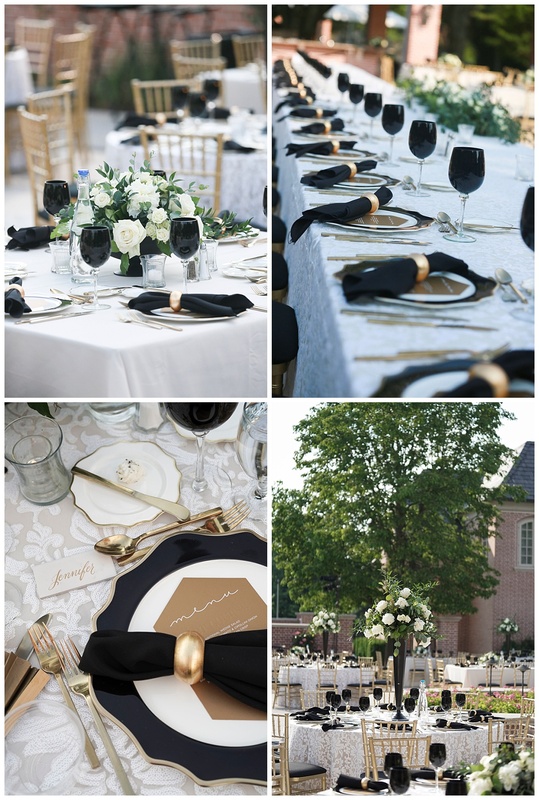 Tones of white, cream, champagne and gold surrounded family and friends. 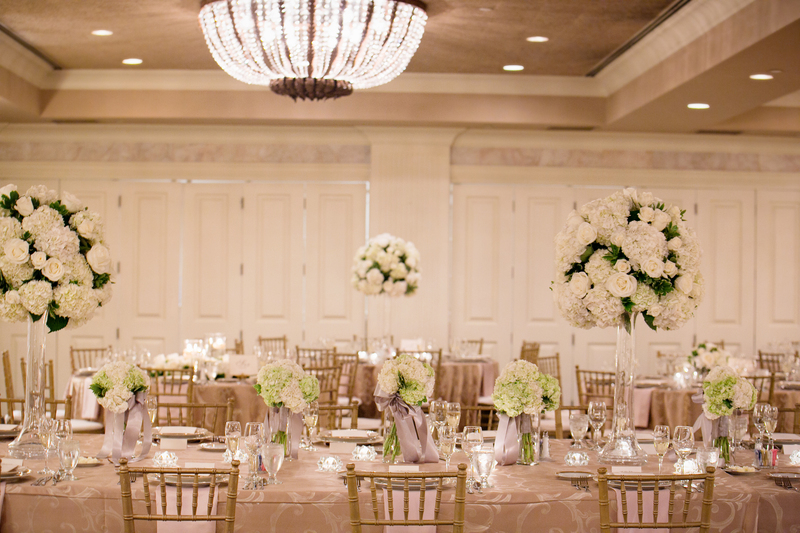 Rich cappuccino linens and decadent gold china helped the candlelit ballroom have a warm and welcoming ambiance. Lush white floral, chosen by Matt, because of his horticulture background, almost stole the show. Each course of the divine menu was artfully served on elaborate gold china. Admittedly, following their menu tasting, I was really looking forward to this wedding night – the day of, it was served to perfection! Yum! Dancing included the traditional Horah to honor Abby’s family, but every guest was in on the action! Ultimately there were 3 circles of guests to ensure there was enough room for everyone to participate. Abby had cutting of the Challah by her grandfather along with having Matt’s dad say a blessing at the start of the meal. 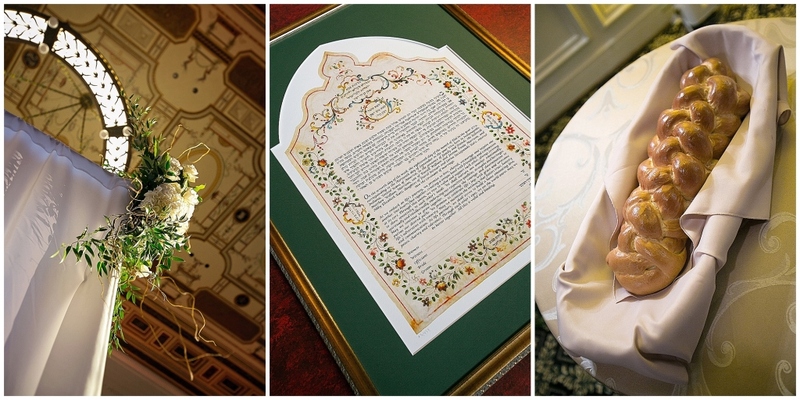 At the ceremony both families signed the traditional marriage contract, the Ketuba, and both the Rabbi and minister stood under the Chuppah, but she stood on the left vs standing on the right. It was beautiful to see how she wove both religions into the day. I looked at Abby’s classic and elegant gown and thought to myself how timeless and regal show looked. The lace detailing was so stunning! Even when she laughed, she was flawless – and that back – WOW! Marriage is about a lifetime together and coming together as one family. 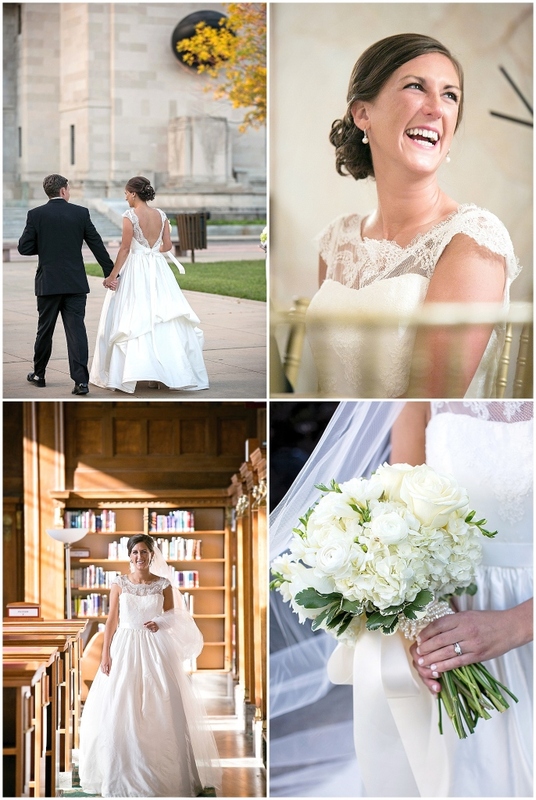 I think Abby and Matt, along with their families, have started that beautifully! They were such a delight to work with and I really enjoyed seeing their gracious spirit, their warm generosity and their loving way. Watching how they blending their religions for the ceremony really is a testament to the flexibility and compromise that is required in a marriage. 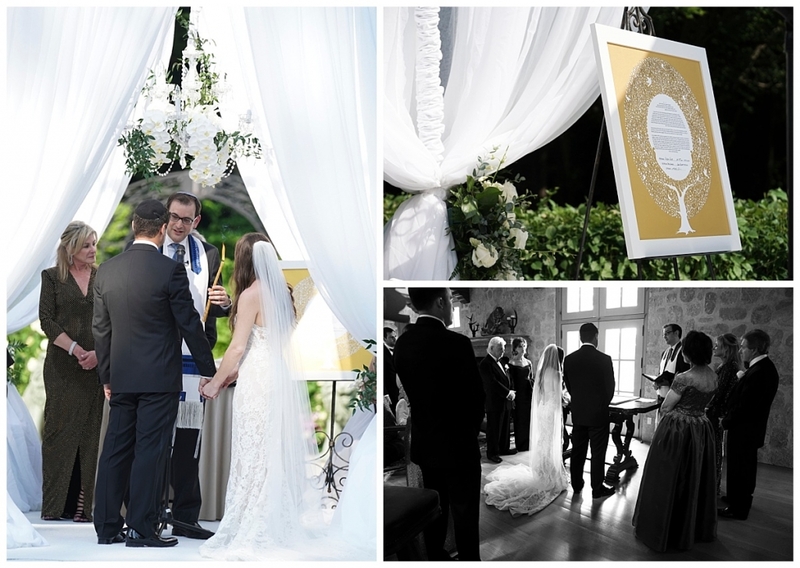 It was a beautiful celebration – and will be the start of a beautiful marriage! Mazel Tov Abby and Matt! Lauren and Tom wanted their summer wedding to have a French provincial warmth to their farm wedding, and undoubtedly they achieved this. They have impeccable taste and it shows in every detail; whether it be the clothes they wear, the stores where they shop, or the vacations they take – naturally their wedding was going to be rich in detail, charm and beauty. Just like the two of them. After meeting at Yale during a freshmen picnic for athletes, the two friends really began dating after graduation in New York when they were on the same co-ed volleyball team. 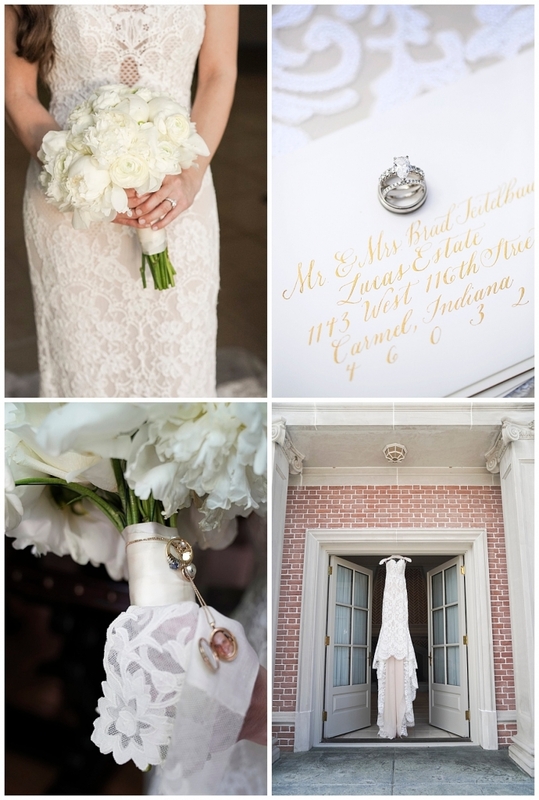 Tall, athletic, gorgeous and brilliant, this dynamic duo has everything going for them in the most energizing city in the world – so when a country wedding in Indiana was on their radar, I’m sure many of their friends questioned the tiny town of Franklin, Indiana for their impending nuptials. Until they saw photos of the picturesque Rockwell-like farm. 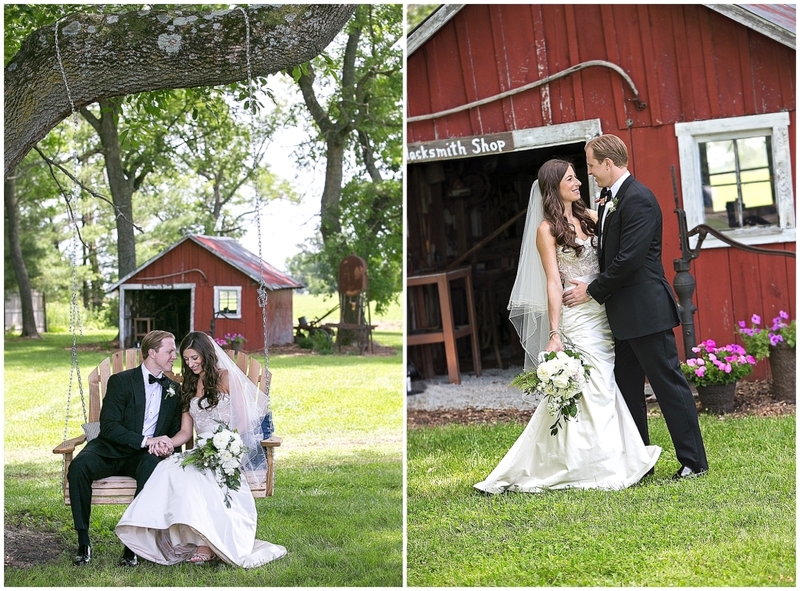 Lauren’s maternal grandparents played hosts to this stunning affair at their home, Fisher Farm. 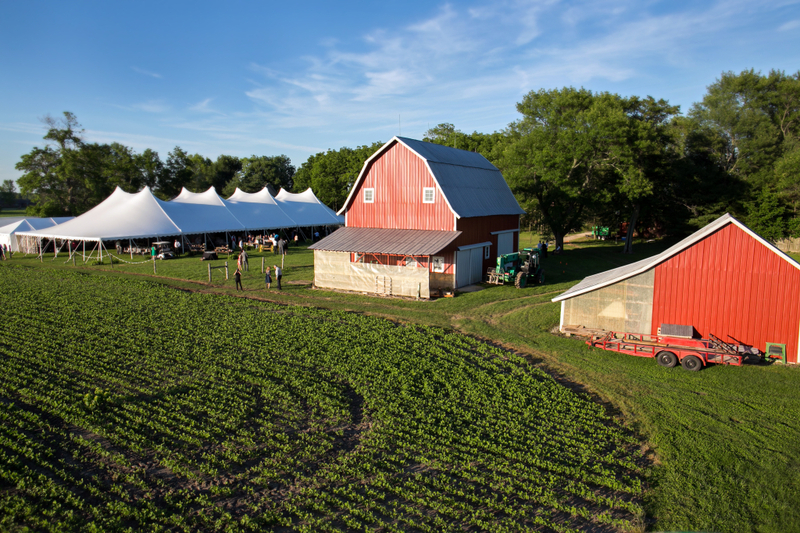 Cultivating their 60 acre farm over the course of the last 8 months became a full-time job for Barbara and Claude lovingly known as Mimi and Papa by the bridal couple, (and by the end of the night, every guest.) 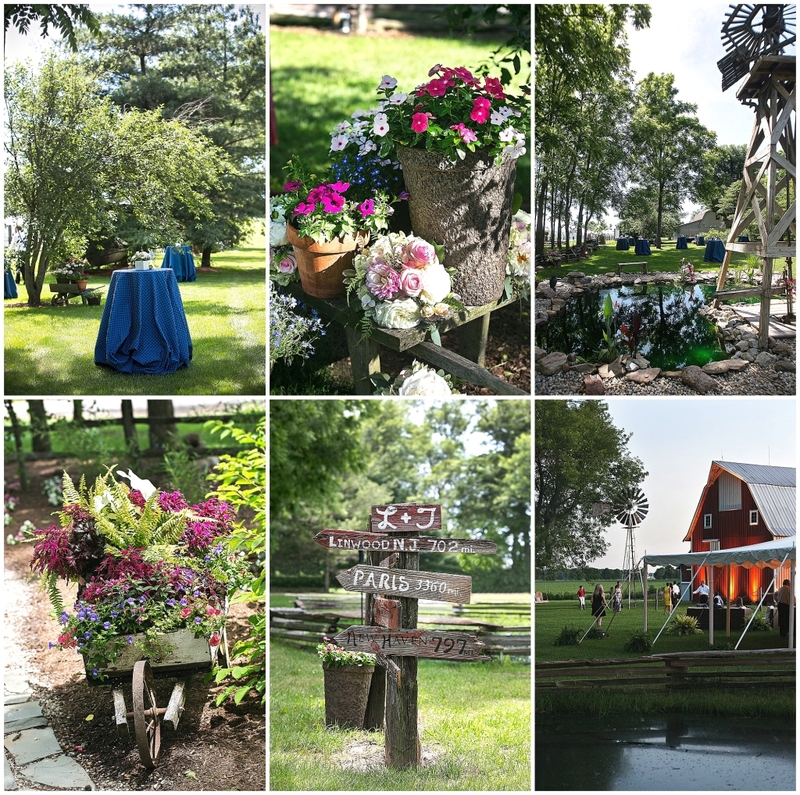 Whether it include putting up a fence around a small pond to ensure guest safety, or planting hundreds of annual beds to make sure everything the eye could see was in impeccable shape, Mimi, Papa, and the bride’s mom, Cindi worked tirelessly. 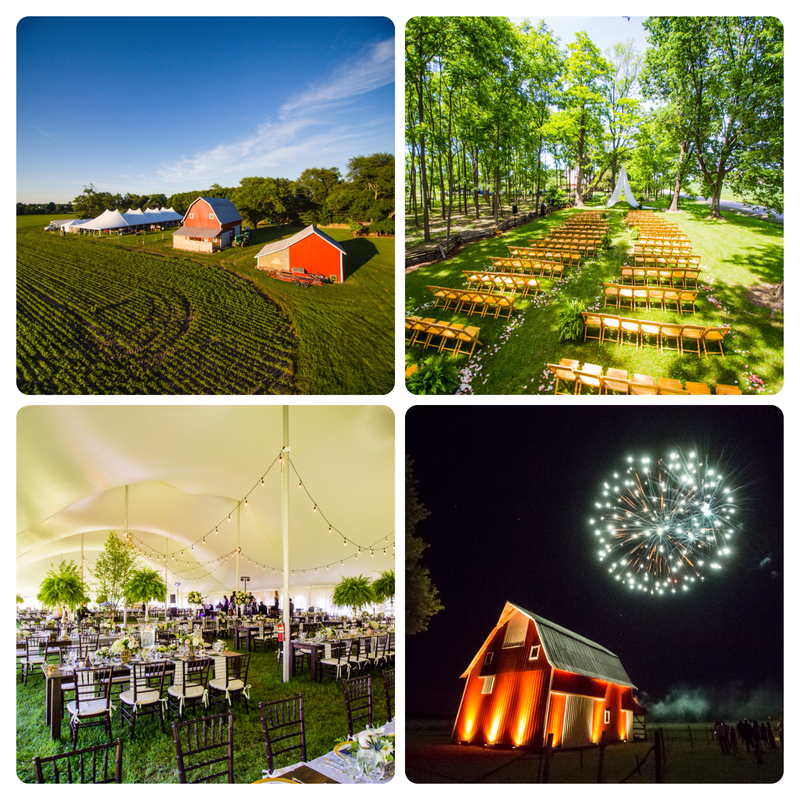 The 150 year old farm has seen many changes in the 6 generations who have hosted family events there, but none quite as spectacular as the wedding for 250 guests Lauren and Tom hosted. Guests arrived to the farm and were greeted immediately by Mimi and Papa with a refreshing glass of Mimi’s lemonade. 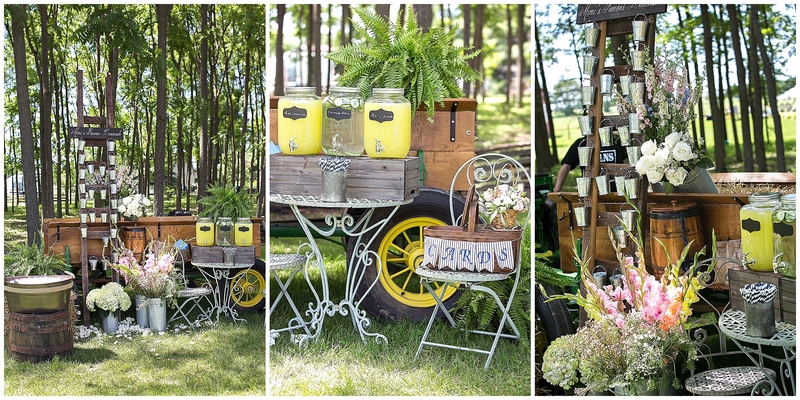 The lemonade was displayed on a restored John Deere tractor style wagon filled with floral buckets. Guests helped themselves to the refreshing drink commenting on the “secret” recipe. 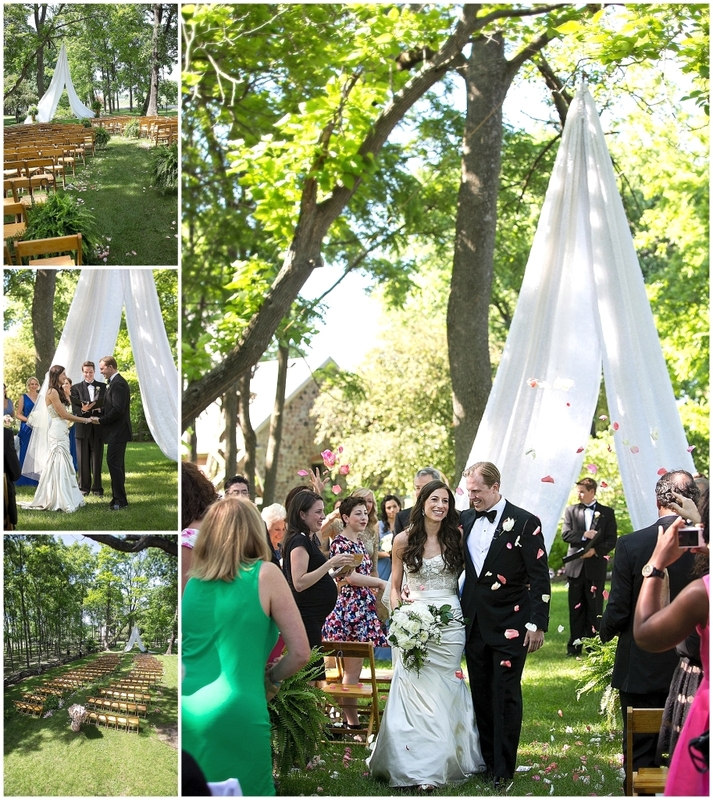 Lauren envisioned her ceremony in the tree grove surrounded by walnut trees allowing shade from the summer sun. 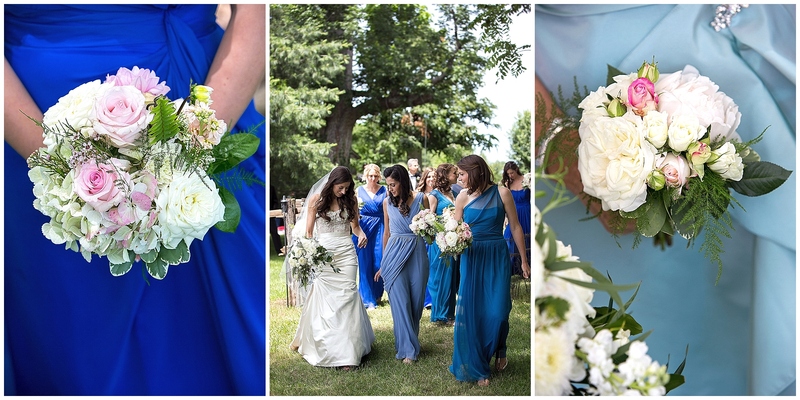 Having a meandering aisle gave the slender bride an angelic walk as she and her 9 bridesmaids in variegated shades of blue cascaded toward the altar. 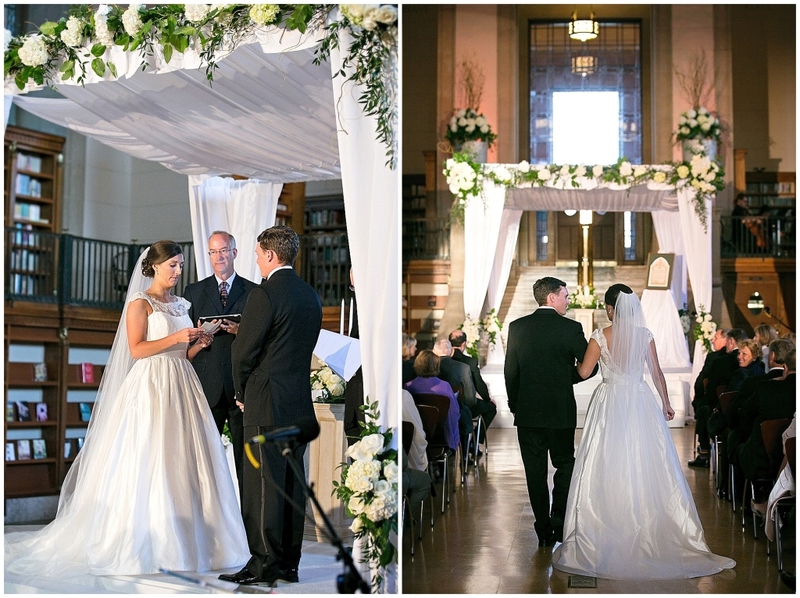 The altar space was created with white organza and lace fabric flowing from a branch to the ground creating a steeple-like setting. 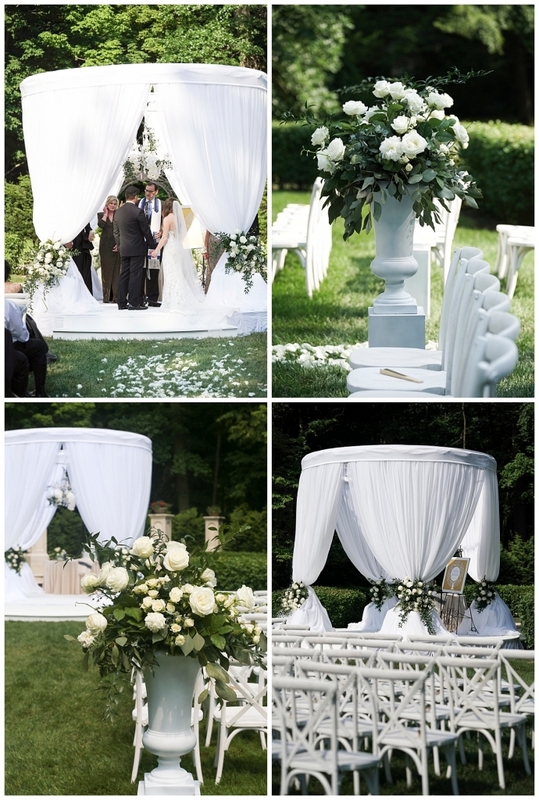 This ethereal space was perfect for the magical ceremony. 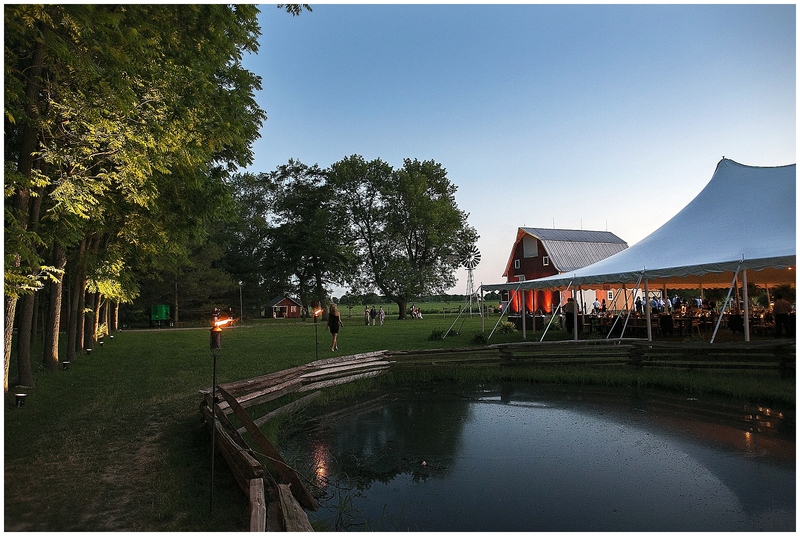 The ceremony, officiated by Lauren’s brother-in-law, told the history of the farm and the couple to the guests. 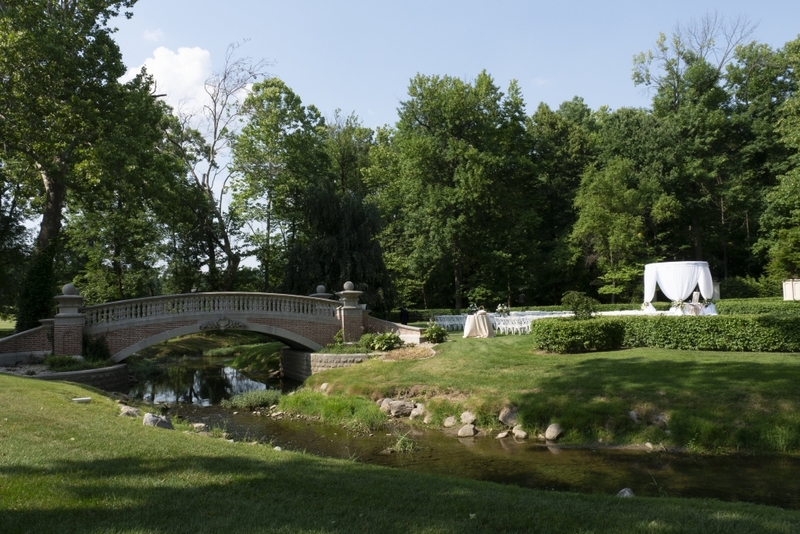 This 150 year journey allowed guests to relax in the summer breeze while sipping glasses of Mimi’s lemonade and savor in the sweet tenderness of the moment. The ceremony included acoustic guitar music which ranged from Broadway classics to pop favorites which engaged the guests. To their delight, the programs for the ceremony were parchment bags containing pink and blush rose petals to be tossed at the newlyweds as they recessed back down the meandering aisle. 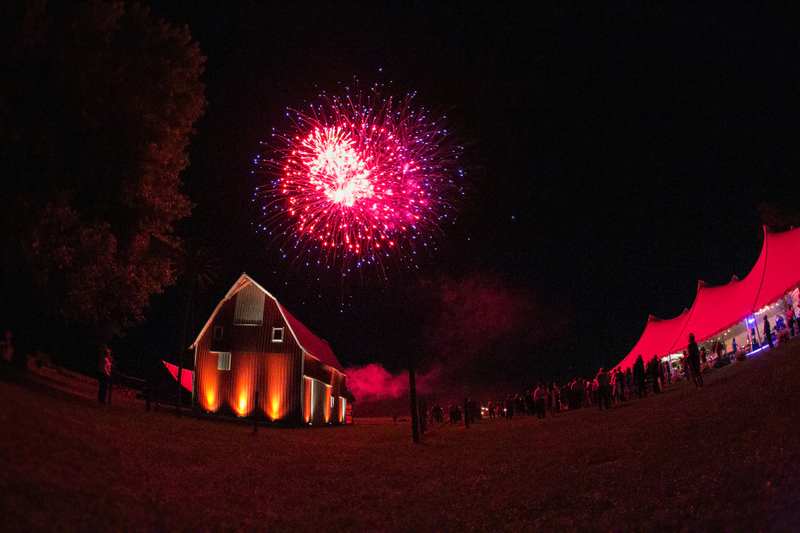 Following the ceremony the guests were able to see their first glimpse of the farmhouse and 100 year old red barn. Surrounded by beautifully cultivated gardens, the home seemed to relish in its role as the focal point of the wedding festivities. Crisp navy linens served as a stunning neutral canvas for the blush, pink and ivory florals which overflowed throughout the cocktail hour. Rustic touches included reclaimed barn wood painted with directional arrows to destinations the couple had traveled to over the years. During the cocktail hour guests reconnected (and recharged courtesy of phone charging stations) before heading into the large pasture which hosted the large dining tent. Inside the large sweeping tent guests marveled at the beauty and grandeur of the space. The florist ensured the line between indoors and out was lost. Large birch trees and ferns filled the space. 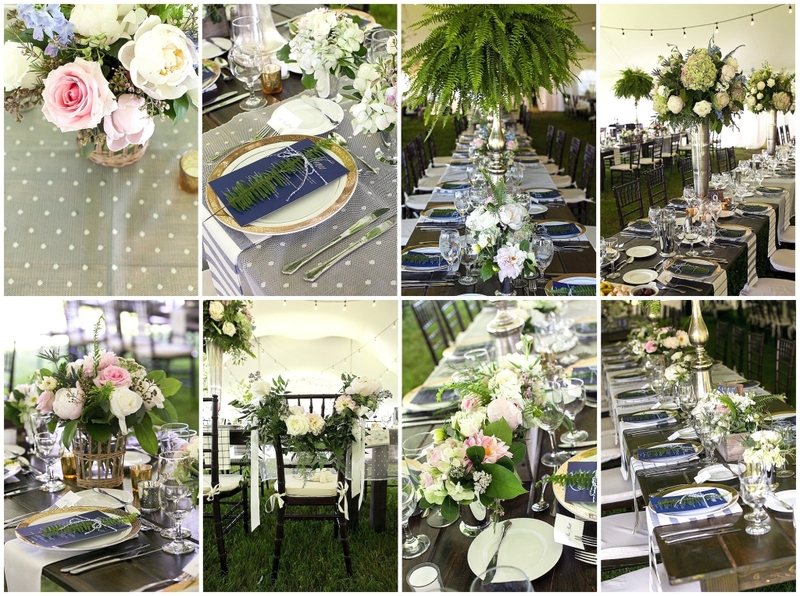 The use of ferns dominated the overall tablescape in large part because of Lauren’s wedding dress. 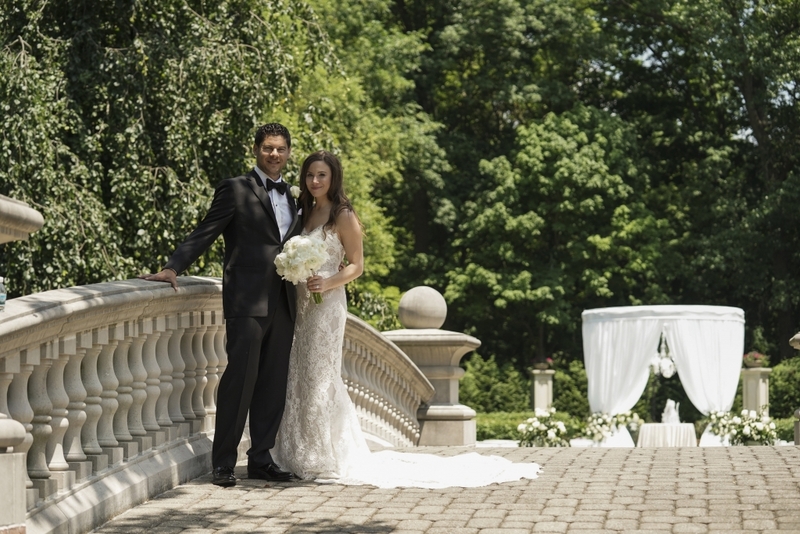 The Monique Lhuillier wedding gown included intricate embroidery on the bodice of ferns so Lauren wanted to include the use of fern throughout the wedding planning. 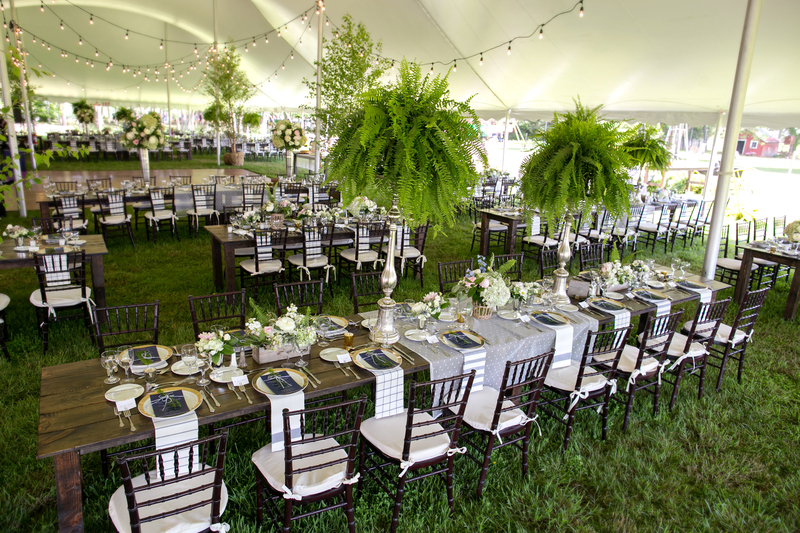 (She did on the invitation stamps, ceremony aisle treatment and dining tent) In the tent the oversized ferns looked spectacular because of their large scale. The ferns were placed on tall stands to bring height to the tables and individual stems were tied lovingly with twine into the menus. The back of the navy menus contained the history of Fisher Farm (written by Mimi) so guests would know more about the 6 generations that had passed through the beautiful landscape where they were about to dine. Flowers were abundant throughout the space. Whether they poured from small wooden crates, baskets or mercury glass vases, they looked soft, refined and had a very French Provincial warmth. The interesting mix of containers, ferns and French ticking stripped napkins completed this look. Dinner infused a bit of the French inspiration as well. One of Lauren and Tom’s favorite dates was a picnic at Versailles. Here they enjoyed cheeses, meats and olives together as a couple. When guests first entered the tent, we wanted to emulate that magical date and serve that same antipasto charcuterie course the dinner menu. Additional courses included a classic “Michigan Salad” to honor the bride’s home state. Dinner was a braised short rib with mascarpone polenta and the dessert was a beautiful and show topping 5 tier cake. 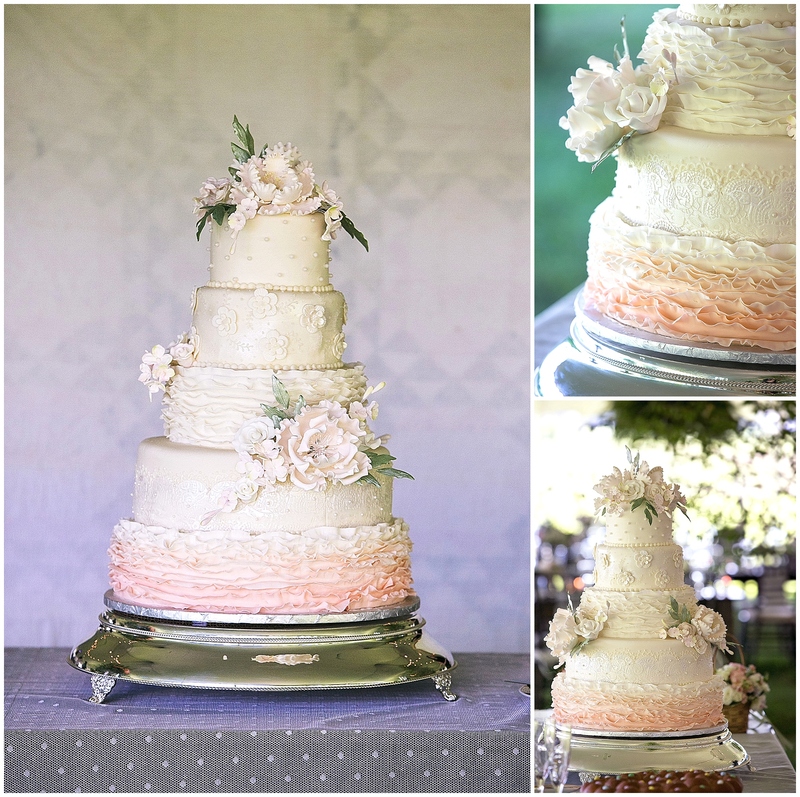 The cake was a stunning confection of ruffles, gum paste flowers and lace detail in tones of blush, pinks and ivory. Sunset fell over the countryside and the 12 piece band swelled allowing guests to dance the night away. Additional desserts and snacks were brought out throughout the evening including a make your own sundaes with a “nitro” station used to make the ice cream. Guests loved the fun interactive display while sitting on the swing or on lounge furniture surrounding the tent. Many guests took this time to explore the blacksmith shop, the barn and peruse the vignettes of historic quilts, carriages and photographs Lauren and her mom had placed around the grounds.